What a fabulous conclusion to a very special day! Weren’t we blessed with amazing weather? – little wind, an orange crescent moon sinking in the sky, plenty of stars, and Jester’s Hill safe to climb. Huge THANKS to the Sancroft-Baker family for making us so welcome on their farm; the Barn was welcoming, candle-lit, and full of food; there was a path of lanterns up the hill to guide us in safety; the beacon lit easily and flamed gloriously into the night sky. 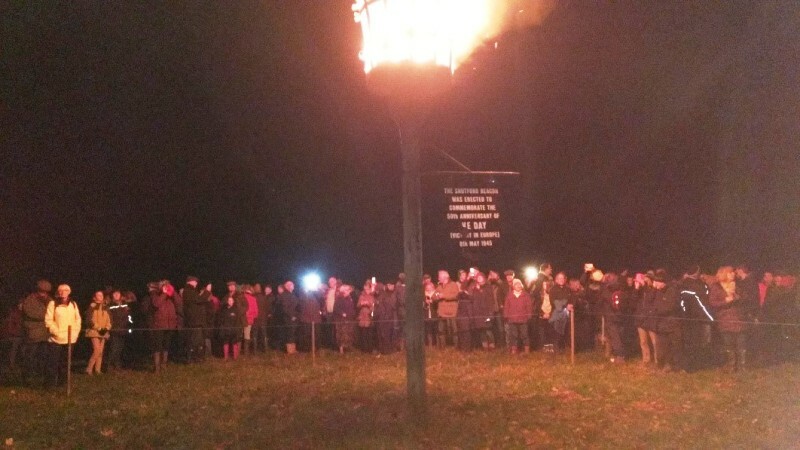 The bugler played Last Post and we stood in silence just before the beacon flared, and once it had got going, we could hear the bells of Tadmarton echoing across the fields. The sharp-eyed identified other beacons, miles away, contributing to this special event. Then Deddington Brass band led us in the singing of O Valiant Hearts, and afterwards played all sorts of war-time sing-along tunes. June Carter masterminded the Remembrance Book. For those who attended but didn’t manage to sign it on the night, it remains in Swalcliffe Church until Christmas – so do call in and add your name. There was a fantastic collection of £450 for the Royal British Legion. So how many people were there? Well, all the soup and the sausages went! The car-park marshals sounded a little panicky as they dealt with the biggest rural traffic jam ever. 300? 400? Certainly, a great many people marked this very special day in a truly memorable way. Thank you to everyone for whatever part you played in making it so wonderful.